In a small contract with big bragging rights, B&T USA will provide their APC9K sub guns to the U.S. Army to arm the military’s Personal Security Details. The Tampa-based subsidiary of the Swiss Brugger & Thomet company was one of six companies last September who submitted designs to the Army for what the service termed “Sub Compact Weapons.” These guns, “capable of engaging threat personnel with a high volume of lethal and accurate fires at close range with minimal collateral damage,” were to be used by the special teams tasked with protecting high-value officers and dignitaries such as the Supreme Allied Commander Europe the commander of U.S. Forces Korea. In the end, the contract awarded on Monday was worth just $2.5 million for 350 SCWs, with an option for up to 1,000 of the weapons. However, B&T beat out a field of big names in the gun world such as Sig Sauer, whose Copperhead was seen as a forerunner of what the company had submitted to the Army’s SCW tender. The military originally courted a baker’s dozen gun makers to submit designs last year, including Angstadt, Colt, CMMG, CZ, Heckler & Koch, Lewis Machine & Tool, Noveske, PTR, Quarter Circle, and Zenith Firearms — the literal A-to-Z in compact guns. Details on the APC9K are slim. Austria’s counter-terror unit, EKO Cobra, uses a similar version of the gun which they list with a slightly longer barrel as being 15.9-inches overall. 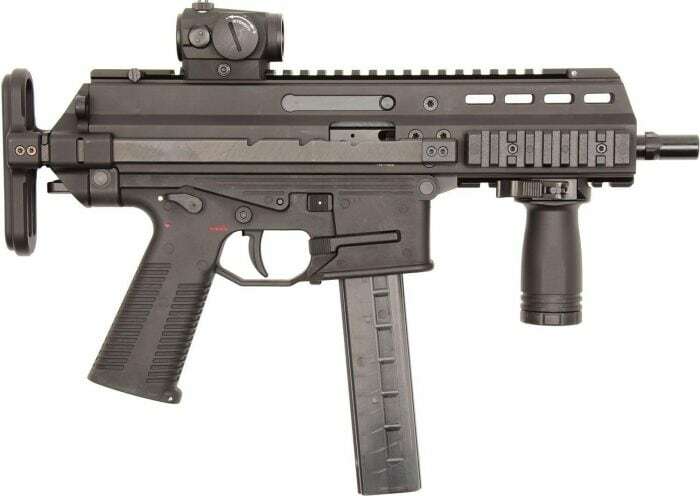 The standard APC9 is a 9mm blowback action three-position select-fire SMG that fires from a closed bolt at a cyclic rate of 1,080 rounds-per-minute. Using 15 to 30 round translucent polymer magazines, the compact room broom features a top rail for optics and backup sights. As for B&T USA, they have of late been concentrating on military and LE sales, with a degree of success and have been teasing the APC9 PRO, a semi-auto version of the gun for the commercial market and those who did not need a select-fire option, over the past several months.